Tonight’s Date Night finds us in a very scary situation. It’s not the restaurant, it’s the neighborhood. 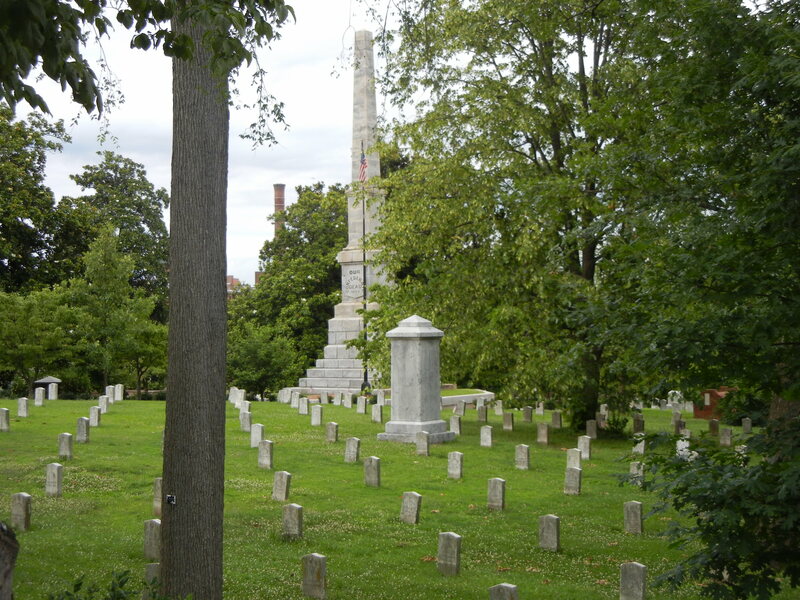 Across the street from Oakland Cemetery lies Six Feet Under. We are headed to the cemetery after dinner, but first, let’s see what’s on the menu. First of all, you must sit on the rooftop if it’s a nice day. This is the best view of Oakland, especially while you are drinking beer on a Friday afternoon. And drink beer we do. You might notice that there are four glasses of Eventide Kolsch on the table. Eventide is brewed right down the street in Grant Park. The tours begin this fall, and we can’t get more local with our beer than this. Joining us tonight are Date Night regulars Claudia and Randy, who we like to do fun things with, which tonight includes a “Malts and Vaults” tour of Oakland. Stay tuned for the tour right after this blog entry. 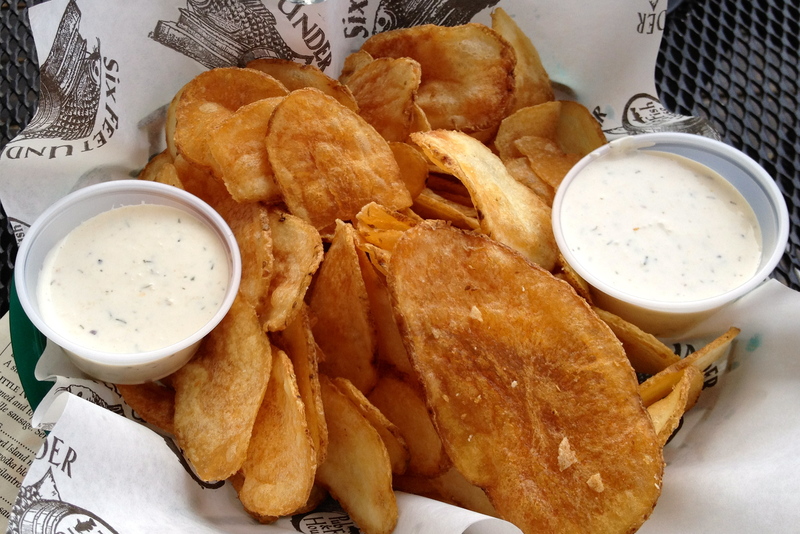 Along with our beer we get an order of potato chips. They are good, but we find out they are “house-style”, not “house-made” so there’s nobody in the kitchen with a mandolin slicing the potatoes. That’s probably for the better if you have heard the horror stories of slicing thin potato chips. By the way, the chips come with a lot of the menu items. Skip them if you are ordering a sandwich. This really is one of the coolest decks in the city. Even with a chance of rain, it’s crowded tonight. In fact, the whole place is crowded, inside and out. It’s a festive atmosphere on this Friday night. We order a variety of entrees. 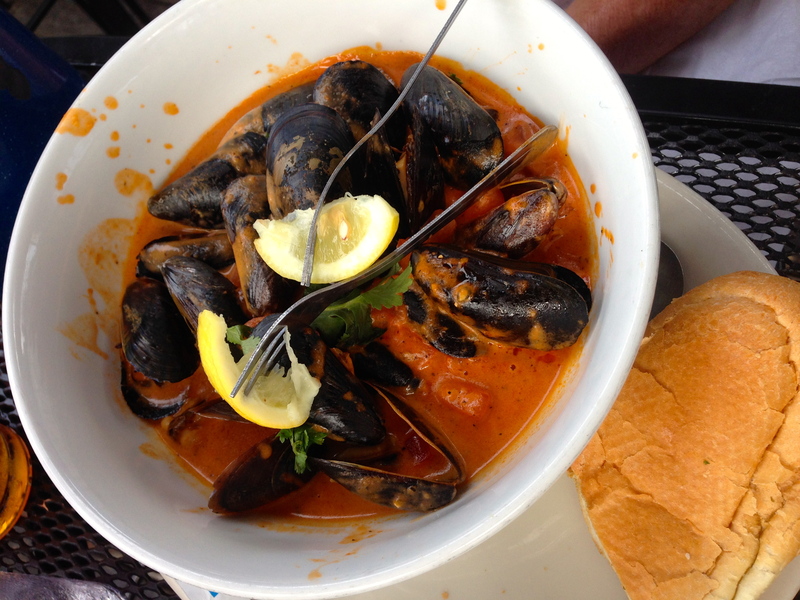 Claudia goes for the mussels. The plump shellfish is served in a vodka tomato sauce. Here’s Randy’s dish. 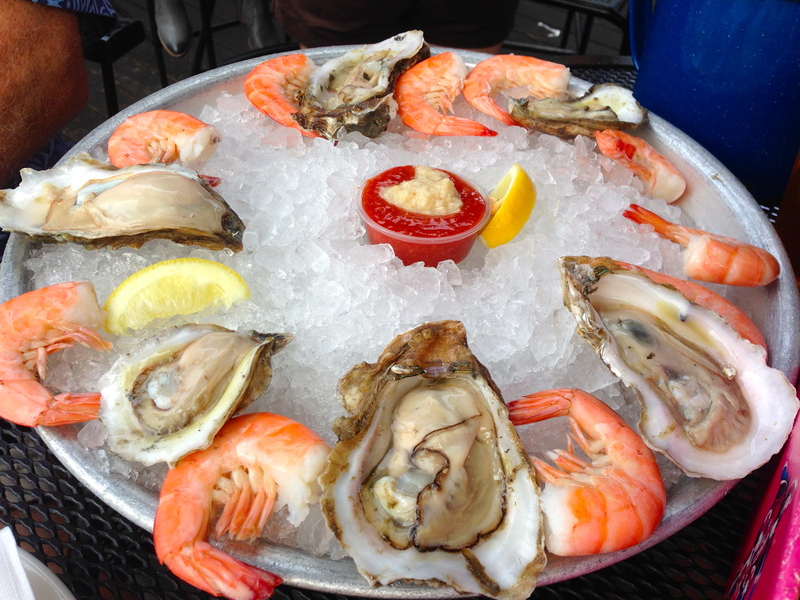 He orders the “1/2 and 1/2”, which is a half pound of steamed shrimp (chilled) and a half dozen oysters. Those shrimp are huge. The chef didn’t work too hard on this dish, but I like the presentation. The chef didn’t do much work on the salad, part of Eve’s “soup and salad” dinner. However, he worked much harder on the gumbo. 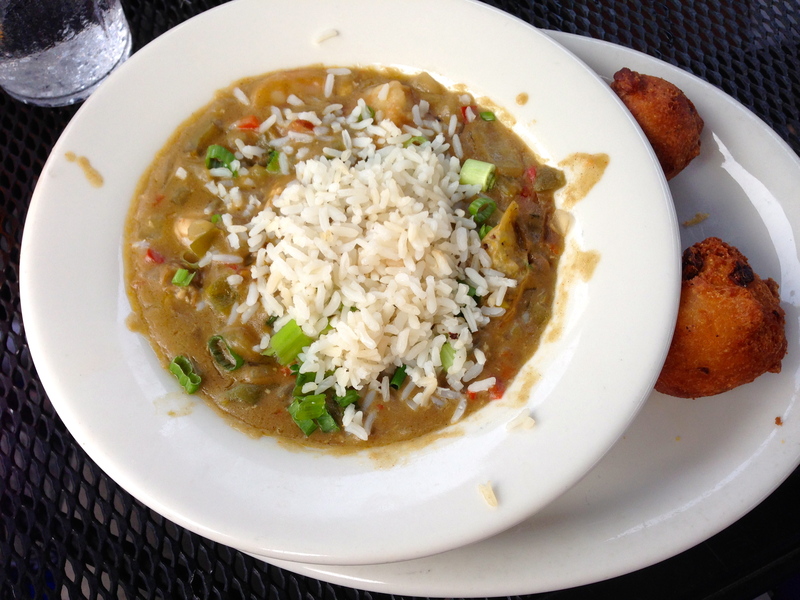 The gumbo is spicy, but not so spicy as to make you sweat, which is not something you want to do on a warm night. 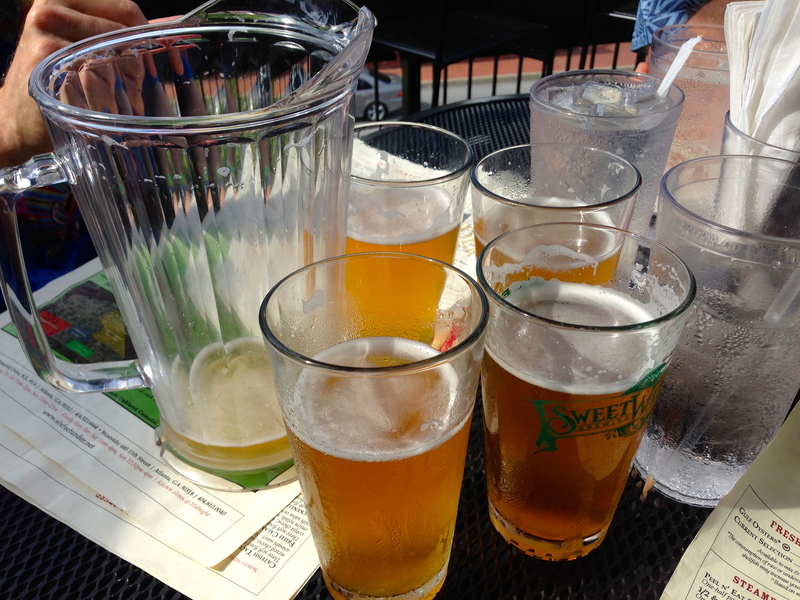 Of course if you are warm, you can always order another pitcher of beer. 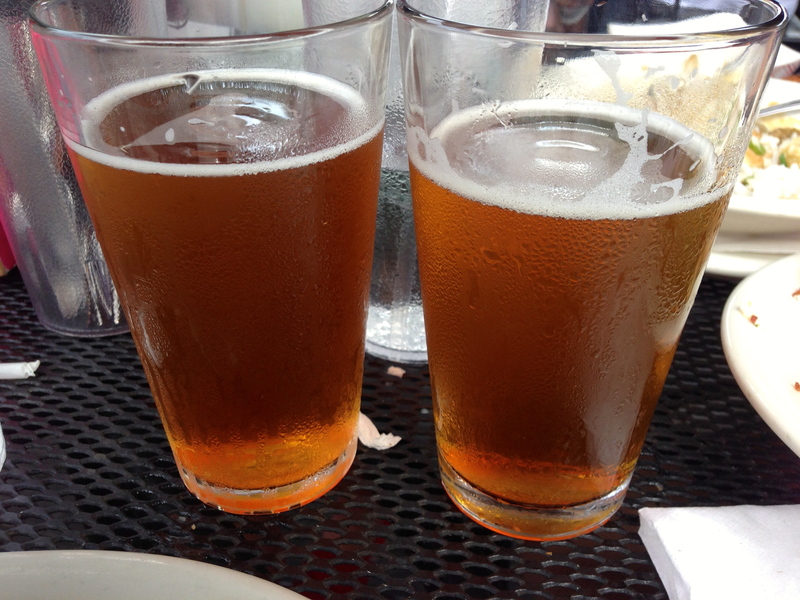 This time we get the Eventide IPA. It’s got a hoppy finish, but it’s not bitter at the end. Did we mention that it’s brewed right down the street? 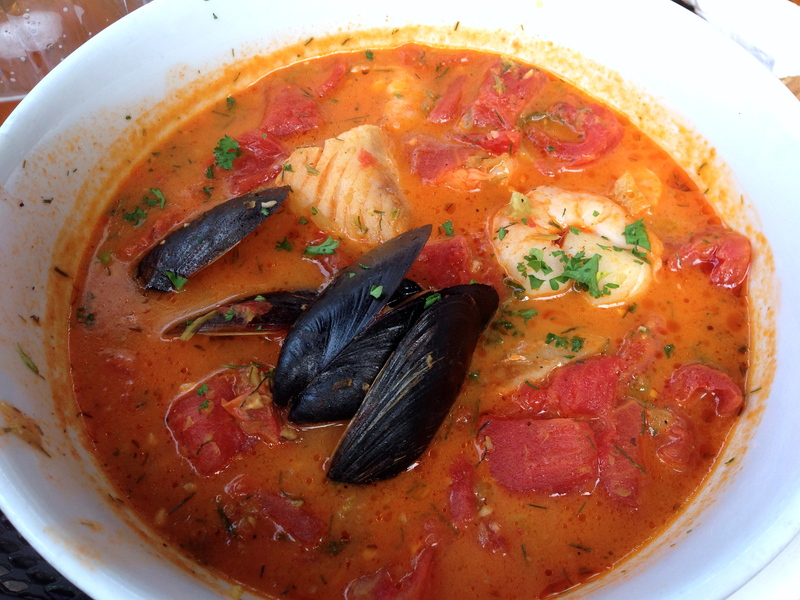 Here’s something that took some cooking skills, the fish stew. Chunks of cod, scallops, mussels and shrimp in a light tomato-fennel sauce make this a filling dish. I enjoy dipping the bread into the broth and sopping it up. It comes with two sides as well. 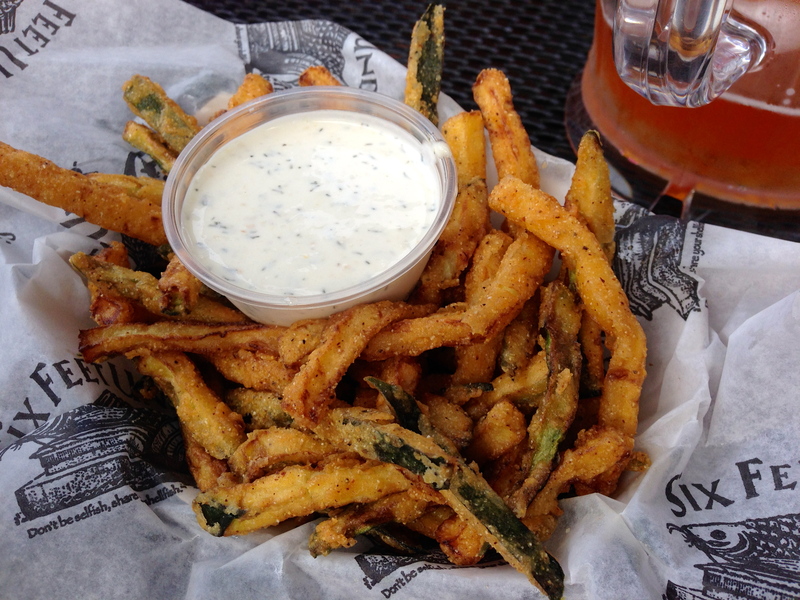 The fried zucchini is a bit limp, but the breading is good. I would have liked this a bit crispier. 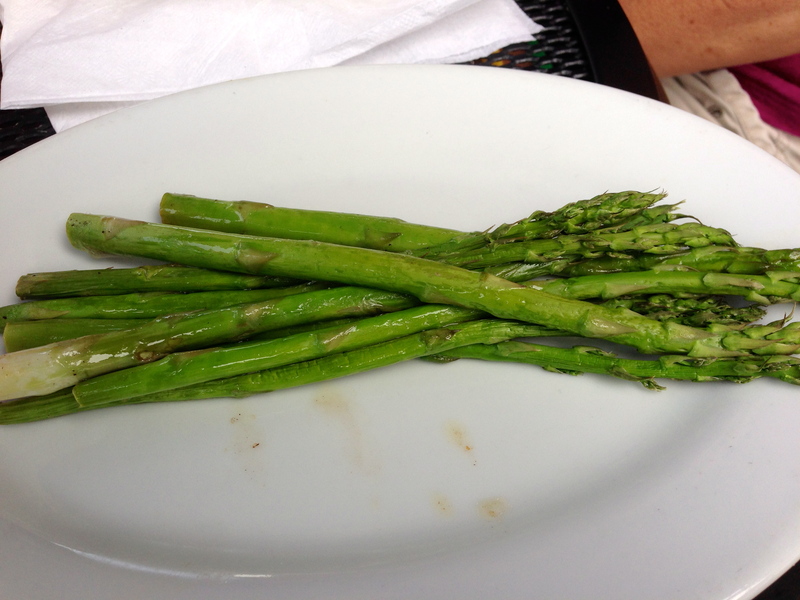 The asparagus is crisp and not overcooked. 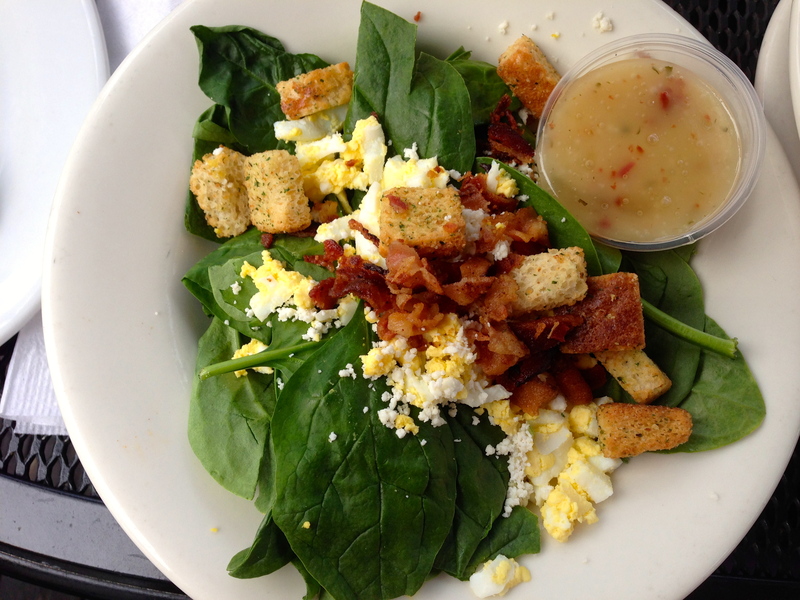 I feel healthy eating it, especially after ordering the zucchini. The bottom line on Six Feet Under: This place rocks. 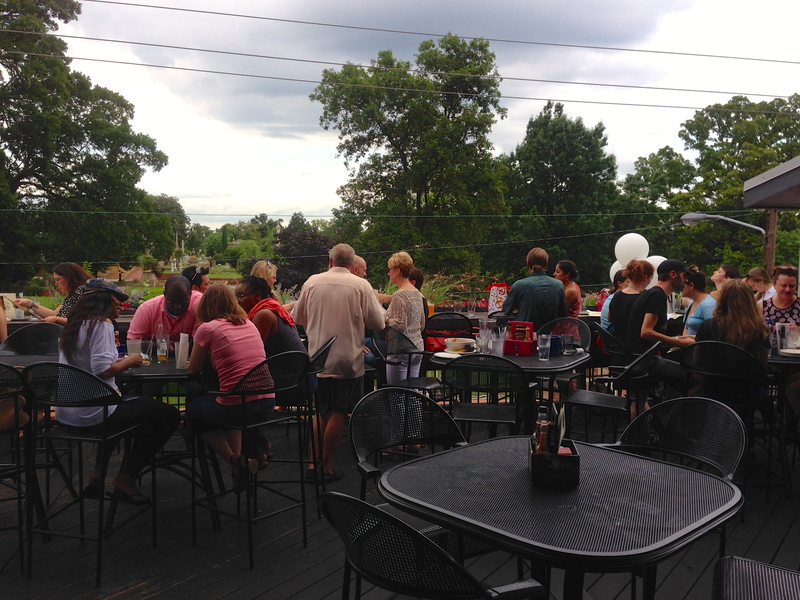 The food is good, the bar is good and there is the buzz of people having fun times. 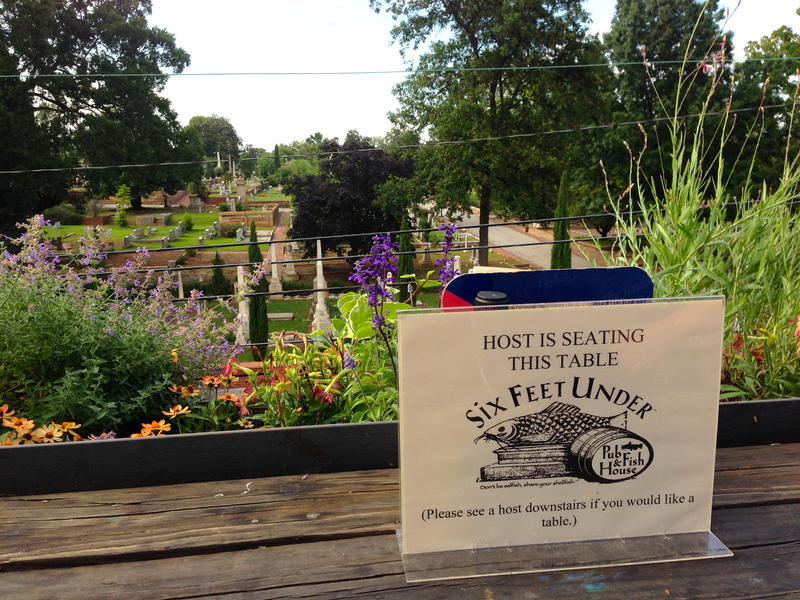 Eat here and then take a stroll in Oakland Cemetery and see the graves of many famous Atlantans, from the first mayor to Margaret Mitchell to the guy who opened the first brewery in the city. It’s a unique way to walk off your dinner. 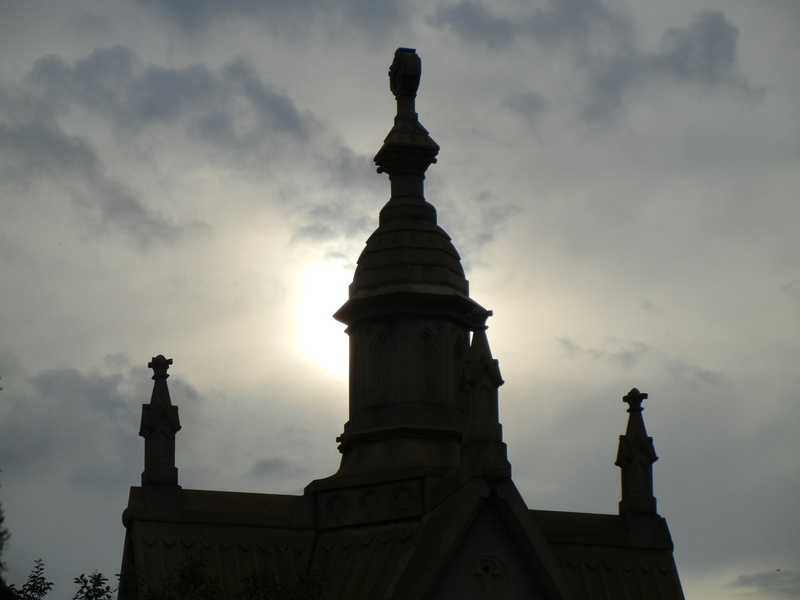 Oakland Cemetery offers twelve different tours throughout the year. We spy the “Malts and Vaults” tour in the local paper and know we must attend. 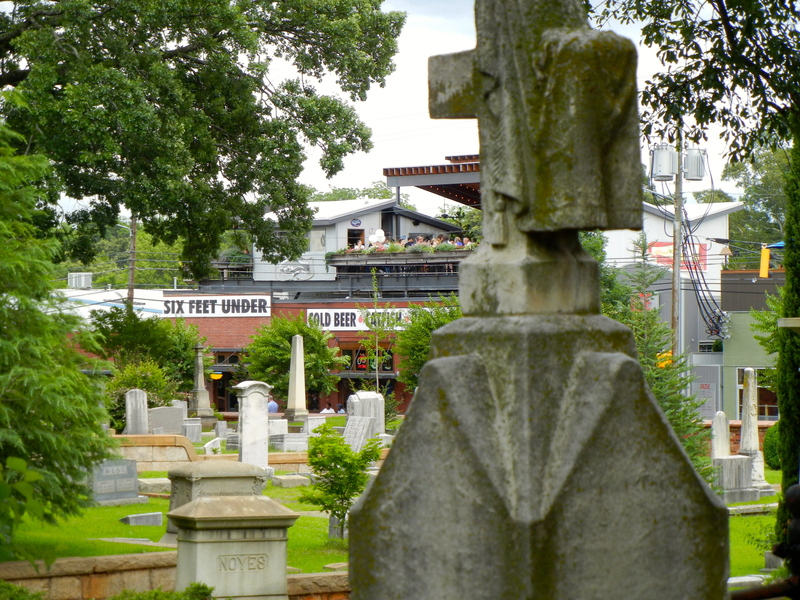 On this sold-out tour, we will visit the graves of people who were the founders of Atlanta’s first craft beer movement in the 1800’s, only to see it all come to a screeching halt during Prohibition. Here’s our tour guide Gordon along with the back of Eve’s hair, which we must point out always looks this good, even if she has been wearing a bicycle helmet for three hours. 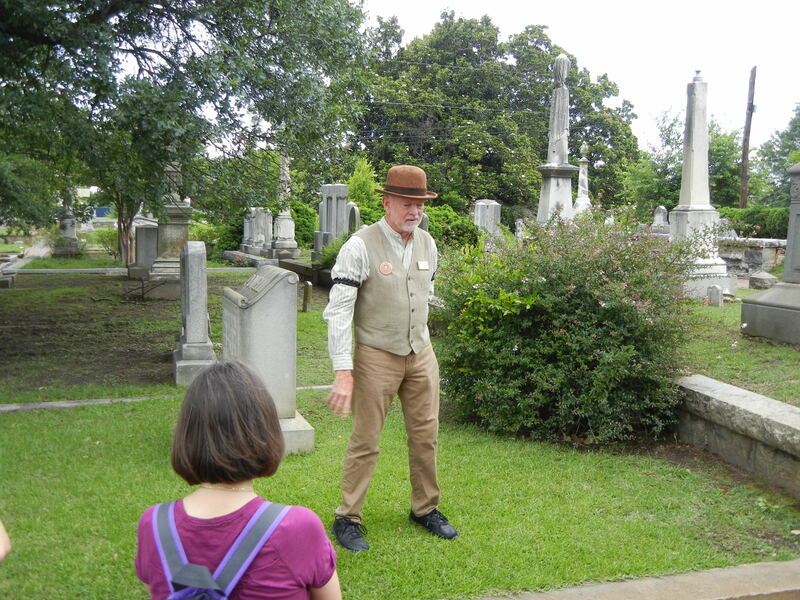 Gordon tells us fascinating stories as he takes us to the graves of Atlanta’s early beer magnates. 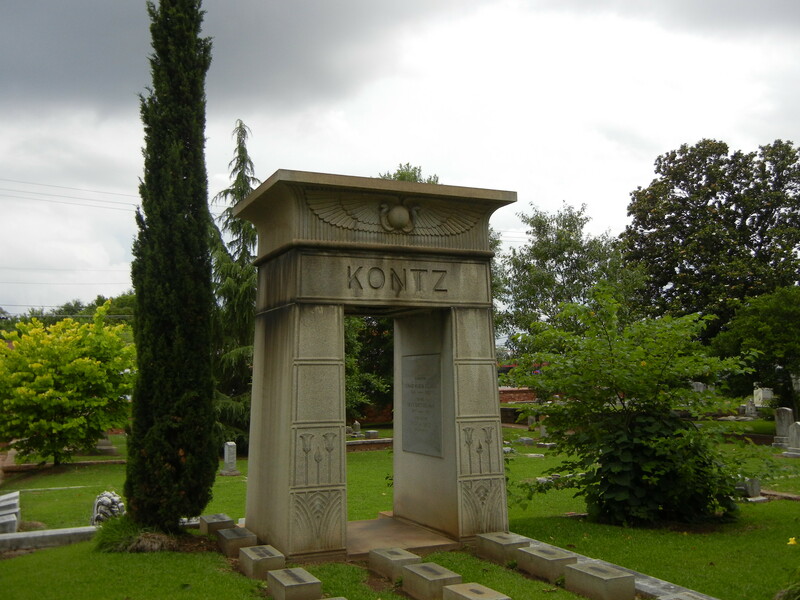 Mr. Christian Kontz was one of the owners of Atlanta City Brewery and legend tells us that he served beer to Union troops during the Civil War. Those of you who have visited Underground Atlanta are familiar with “Kenny’s Alley”, which was named after this guy. 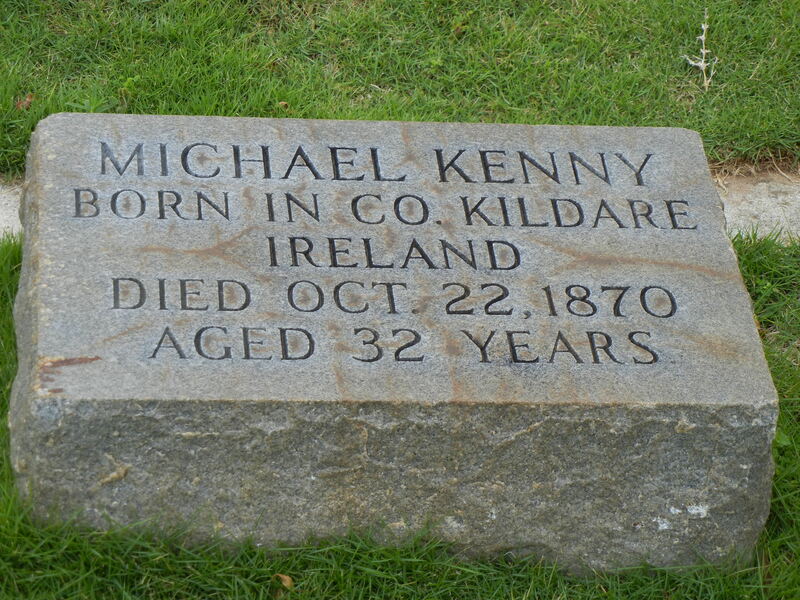 Michael Kenny was a barkeep in Atlanta and died young in a jousting match. Now you know. 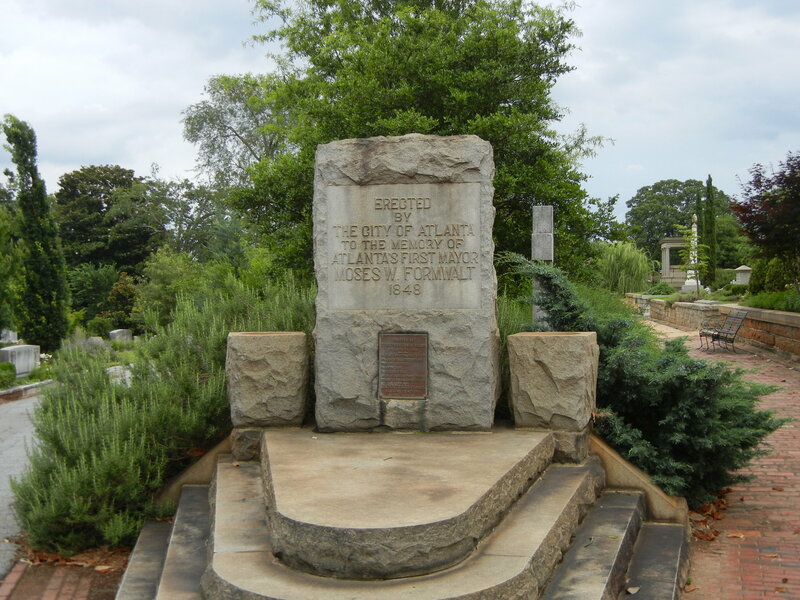 Here’s the first mayor of Atlanta, in a regal grave that was constructed to honor him. We will let you go find Margaret Mitchell on your own. We have a lot of fun on the tour. 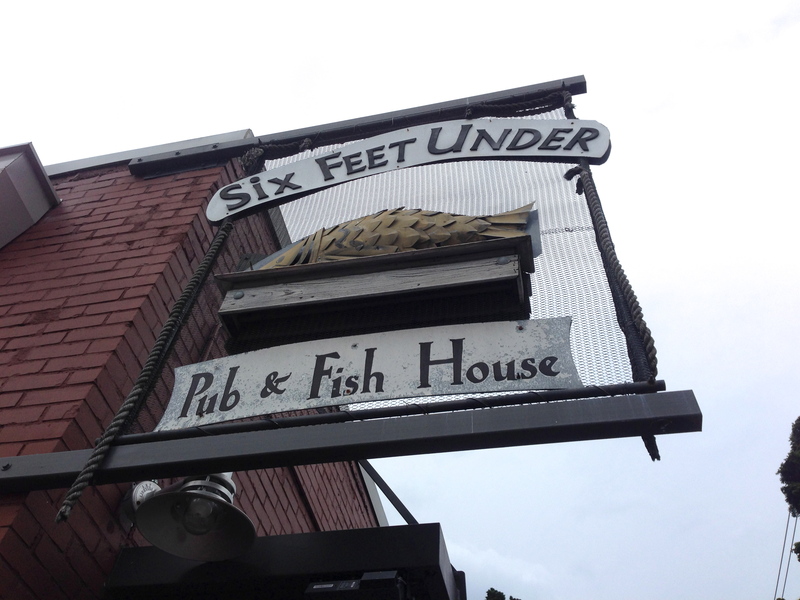 It might be a stretch to say that Atlanta has a deep beer history represented in Oakland, but it’s such a cool place that you must check it out after your meal at Six Feet Under. For a good list of Oakland tours, click here. You will thank us after you go.